Apple’s Stickies program, which lets you put Post-It-style notes on your Mac’s screen, has been around for nearly 16 years, yet apart from styled text and the capability to store images, today’s Stickies can’t do much more than the version that debuted in System 7.5 back in 1994. If you’ve ever wanted a stickies-like program with more features and flexibility, check out TaskCard . 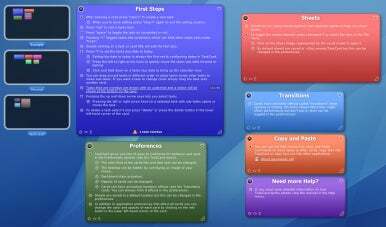 Like Stickies, TaskCard lets you create onscreen "post-it notes," which the program calls cards. You can resize each card to your liking, choose a color for each card, and collapse any card to its title bar. Global settings let you choose your preferred font, as well as card opacity and color-gradient level (you can't set these on a per-card basis, unfortunately). Within any card, you can also apply basic formatting—bold, italic, underline, and strikethrough—to individual tasks.